Europa-Park: Silvester (New Year) 2016/17 – TowersStreet - Your premier Alton Towers guide! TowersStreet and EuropaStreet are heading to the continent for what’s shaping up to be our biggest European meet yet! We’ll be kicking things off with a two night trip to Strasbourg France. It’s then time to move onto Europa-Park in Germany for four nights, where we’ll be seeing in the New Year with their annual Silvester party. As the meet is taking place over 6 nights, you’re more than welcome to join us at any point over the course of the trip. So if you’d rather do one night in Strasbourg, or just 3 nights instead of 4 in Europa-Park, you’re more than welcome to. We’ll be providing meeting points on each day if you wish to meet with the group. 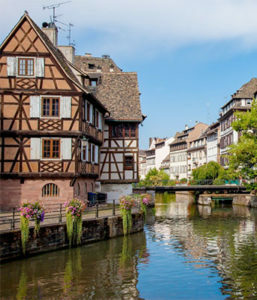 There’s plenty of accommodation around Strasbourg centre, with our recommended accommodation being in the historic quarter of ‘Petite France’. Ibis Strasbourg Petite France is where the majority of people will be staying, or check here for other options over on booking.com (link based on 2 people sharing for 2 nights). Ibis hotels will allow you to book at a more expensive rate and pay on arrival, and there are also similar options on booking.com. Europa-Park is right next to the town of Rust, and there are plenty of options for apartments and guesthouses across the area. 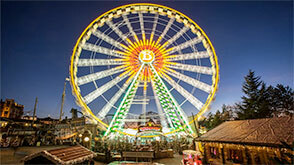 Due to the popularity of Europa-Park’s New Year and Winter events, occupancy throughout the town is extremely high at 67%. There are however, still options available, and some will allow payment on arrival rather than payment in advance. You can check prices over on booking.com, and you can search for 4 nights and 2 people on this link. 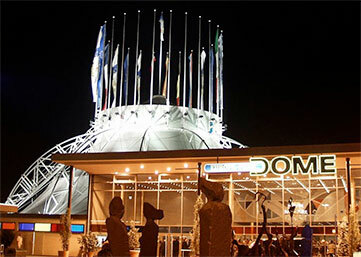 The Europa-Park dome hosts Europa-Park’s annual new year party, with multiple rooms hosting different DJs. The event is separately ticketed, with tickets and further information being released shortly. Prices will be around €28, but should they be released please don’t book your tickets just yet. We’ll announce further information once we’re able to. 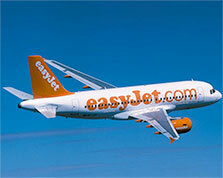 Unfortunately, flights to Strasbourg no longer operate from the UK. If you wish to fly, you can either travel to Baden Baden in Germany with Ryanair from Stansted. There’s also flights to Basel on the Swiss border with Ryanair, British Airways or Easyjet from multiple London airports, Bristol or Manchester in the north. A shuttle service can be booked, with more information on this to come. There’s also the option of driving, with around a 6 hour drive to Strasbourg from Calais and just under an hour to Europa-Park. The crossing can be made in 35 minutes via Eurotunnel or 1h30 via ferry. Due to the length of this meet and the different options available, there’s no automatic who’s going list below. If you’re interesting in attending this meet, please reply on our forum topic. Here you can also ask any questions relating to travel, accommodation or anything about the trip in general. There will also likely be people with spare spaces in hotels available, which we’ll endeavour to post in the first post of the topic as they’re offered out.